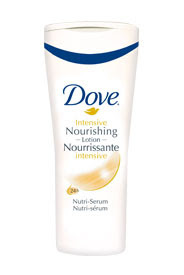 I have been a fan of Dove’s Intensive Nourishing Lotion for a long time. The lotion feels light and thin in your hands but don’t be fooled! It’s actually a heavy duty lotion and its moisturizing benefits really do last and last. The scent is soft as well and that’s always a plus. I’m not sure why this lotion is listed as “new” on the Dove website but if you haven’t yet tried it, you should. It keeps skin moisturized and absorbs easily.